With G&H you can feel comfortable knowing that a registered Technician is present on every job. 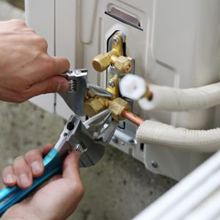 G&H Technicians will do their best to repair your heating and cooling systems rather than trying to sell you a new system. G&H will assist you with selecting the best system for your budget. We will analyze your business to insure that the right size system is selected for optimum comfort and efficiency. G&H has a wide range of experience with many brands of HVAC systems including RUUD, Amana and Lennox. Like all things in life it is less expensive to prevent a problem than fixing the problem. With routine maintenance 80% of all repairs could be prevented. The Engineering Society for Air Conditioning, Heating & Refrigeration states that your system can degrade anywhere from 1%-3% per year. When an air conditioning system starts to degrade it will work harder to produce the same result. Maintaining your entire system reduces the degradation rate and allows your equipment to run more efficiently and closer to its original condition at a lower cost to you. At G&H we develop custom programs tailored to your business needs. Whether you have a single building or multiple buildings, G&H has the experience and flexibility to meet all of your preventive maintenance needs. Studies from utility companies indicate that preventive maintenance more than pays for itself in energy savings.